Tea has been consumed with food for centuries, so it seems rather funny to talk about tea and food pairings. However, as high quality tea becomes more widely available there are many opportunities to look at what you want to eat with your prized tea to enhance its flavor and give you new experiences. We bet there are certain foods you wouldn’t think to have a cup of tea with. So here are 3 unusual tea and food pairings you might want to try. 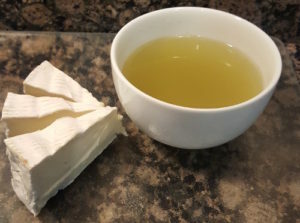 Brie and Matcha Infused Sencha – Yes, France meets Japan. Given that Brie is typically paired with a Chardonnay or fruity light red wine, Matcha Infused Sencha was a shock. This grassy tea compliments the Brie and enhances its flavor without losing its own. The two together create a lite nutty flavor that is smooth and creamy. Tomato, Basil & Garlic Pasta with 2nd Flush Darjeeling – Pairing this fragrant, yet strong, tea with a tomato sauce makes for lovely combination. The crisp Darjeeling cuts the acidity of the sauce while enhancing the basil with other herbal notes. Darjeeling is surprisingly versatile, so pair it with your favorite tomato sauce and pasta combination. It also stands up to your favorite spicy dishes. Roasted Nuts & White Peony Tea – The next time you reach for your favorite roasted nut for a snack, grab a cup of white tea to go with it. The combination of the salty nut and floral white make a third flavor together that is like cream. This is especially true with pistachios, cashews, and almonds. Pairing tea with meals is similar to pairing wine with meals. Lighter teas with lighter foods and stronger teas with stronger foods. However, don’t allow that guidance to stop you from experimenting. The complex flavors in teas make them very versatile and fun to play with. So bring out your favorite tea and pair it with some of your favorite foods you wouldn’t consider. You will be amazed at what you find. This entry was posted in Cooking with Tea, General Tea Background. Bookmark the permalink. Like what you see and want to reference it? Have a look at our acceptable use policy.